Zimbabwe has a terrible record when it comes to media freedoms. One of the areas where people expressed relief with the presidency of Emmerson Mnangagwa has been a seeming expansion of the media space and the government’s seeming disinterest in quieting disagreeing views whether in mainstream media or on social media. The past few days, however, has shown a different colour to this leaf. Social media has been blocked since Tuesday in fear of protests that were ongoing from Monday to Wednesday this week. Worse, there has been a total blackout of the internet for a continuous 30 some hours and another continuous 15 hours at least. This at the direction of the government. The legality of these actions is before the courts as we speak. The government is citing the Interception of Communications Act Chapter 11:20 as the law that gives them authority to make such directives but we argued that this piece of law does not say that and the bit that could be interpreted as such is too vague, generic and infringes on the constitution and cannot possibly be upheld by the courts. MISA Zimbabwe, a media activist group agrees with us and they have taken this matter to court. 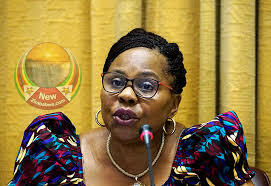 Yesterday the minister of information, publicity and broadcasting services Monica Mutsvangwa was speaking at the Zimbabwe Defense College and she mentioned that the government was ready to bring a bill (law in waiting) that regulates social media before parliament. The bill which they are calling a cybersecurity bill will, of course, include some measure to enable the defence of the nation in cyberspace against hackers for example. The minister emphasised however that the bill will regulate social media and the spread of information. She called it the ‘proliferation’ of information. According to Mutsvangwa, this bill has already passed the cabinet legal committee. The events of this week prove that this government cannot be trusted with such a law. The rush to switch off the internet shows that they see the technology as a nuisance that threatens them politically and they are prepared to get rid of it at whatever cost. If they are prepared to turn off the whole internet without regard for services that depend on the internet like buying a box of critical medicine for one’s dying relative then they care nothing about you communicating with your loved ones cheaply over WhatsApp. The ruling party has two-thirds of the parliament so if they really want their cybersecurity law then they are going to get it without much hindrance except for procedural bottlenecks. what more would you expect from these mafia gangsters ?? I tuned in to radio news after a long, long time only to hear that nonsense. Apparently, the ‘society’ they want to protect from the ‘proliferation of information’ is themselves and everything they’ve gained through abuse of power. We are going to end up with the worst hodge podge mix of russian, north korea, eritrean internet censorship with ‘chinese characteristics’. Anyway, now that net is up, let me go and try to swipe for groceries before Monica and team leave me stranded again. Next time when we have elections everybody will understand better the choices they make. We deserve this rough treatment, we asked for it by not being decisive on the ballot box. cowards of a government let them try their days are numbered. God is watchinga nd soon to strike. More oppressive than Mugabe even. Each country has it’s sovereignty to protect. If the government feels that it’s people are abusing social media for their gain then I think it’s okay to temporarily shutdown the social media. I don’t think Zimbabwe is the first one recently the Chinese government did the same and in some countries they don’t allow. Is this person serious? What sovereignty can you speak of when the agenda just to safeguard the interest of a specific group of people. Basically that’s shallow thinking, a government should be able to reason beyond 60% of its people for it to be effective not what we are currently witnessing. Shutting off social media doesn’t bring down the price of bread which is the real challenge we have. Address it and you will see the people won’t be doing that so called “abuse of social media” you are instigating. You know, you just reminded me of a line this cartoon villain, Overlord from Spiral Zone, used to say in the beginning of every episode: ‘Surrender, or pay the consequences!’ You can draw whatever meaning you will from that. In the meantime, fire up your VPN and let one of the greatest cartoon openings of all time proliferate awesomeness through your soul! There will never be a digital industry in this country given the arbitrary shutdown and control the net. The stupidity of this week has been astonishing. Zimbo’s are now out of hand, it’s now too much! you need the sin bin. It is sad that those who do not understand democracy or human rights comment on issues beyond their reasoning ability. whats app and social media was deliberately and unlawfully used to cause panic and concern to amongst other school children. Teachers were beaten and stopped from attending schools children who also have cell phones were subjected to concerns for their parents told they would be attacked for simply taking their children to school. The govt did thev only thing possible to protect the people from the violence and trauma of the out of control terrorists disturbing the human rights of all. Many countries all over the world have done the same responsible thing when faced with a terrorist attack against the people and their property. The government is too soft there is a need to protect our property .from terrorist type violence like this with more force so that those malcontents can understand they are simply criminals. First, even if every country on the planet reacts the exact same way, it does not make it the right response. I have that problem with our reasoning on the content: we wait for other’s standards not create our own. Second, I think your reading of human rights is a bit narrow and convenient to already held beliefs or biases. you use words like force in an argument to protect people’s rights? The government is too soft? Really?? Finally, I am against violence and the destruction and looting that happened on Monday BUT you don’t stop criminal activity by depriving the whole nation of its rights no matter how easy or convenient that is. piss off you zanu apologist john ! !